This year’s Stack Overflow Developer’s Survey asked 64,000 developers how they learn, the tools they use and what they need. According to the study, SQL is the second-most common programming language, utilized by half of all the developers in the world. Edgar F. Codd created the RDBMS while Donald D. Chamberlin and Raymond F. Boyce created SQL in the mid-1970s. Relational algebra and tuple relational analytics are the two types of mathematics that grew explicitly for relational databases on which SQL is originally based. Oracle SQL is easy-to-learn language compared to other languages. You can quickly get familiar with the predetermined number of functions used to run inquiries and return information. Even roles that are traditionally non-technical such as marketing, C-level executives, and specialized product managers are known to learn basic SQL through Oracle SQL 1Z0-061 certification in order to support their jobs. With half of the world’s developers using SQL and RDBMS, it’s safe to say the language and technology are ubiquitous. Oracle SQL has become the basic language among developers these days because of its severity. Abilities and skills gained from SQL and RDBMS can transfer effectively between organizations and businesses, enabling knowledge and growth. Despite countless other database systems and technologies and their growing popularity, SQL databases have lasted 43 years and are undoubtedly here to stay – at least for the foreseeable future. With the arrival of big data, deep learning, and IoT, it wouldn’t be surprising if SQL databases thrive and expand for another 43 years. Check out the three reasons why you need to choose Oracle 1Z0-061 certification. 1. Oracle SQL developers specialize in the design, implementation, and maintenance of structured query language (SQL) databases. They may act as a web developer that depends upon a particular position. This is one of the most crucial reasons as to why Oracle SQL 10-061 certified developers get paid handsomely. According to Indeed, an average SQL 1Z0-061 certified developer makes approximately $114,500, which is almost two times a middle-class family’s income. 2. When you recognize the database that stores the information you are using, SQL can answer your questions about data. You no longer need to rely on overly simplified, pre-built reports or co-workers to track down data. Oracle SQL allows you to become a progressively efficient and independent worker. 3. SQL questions can be saved and utilized again at any time. SQL code can also be edited with comments, so you can include clear descriptions directly in your query. With SQL code, you simply write the code once, save it, re-open it, and re-run it if you ever need to produce a report twice. Think of the hours – even days – that you could get back each month by not having to manually produce reports that could easily be automated. 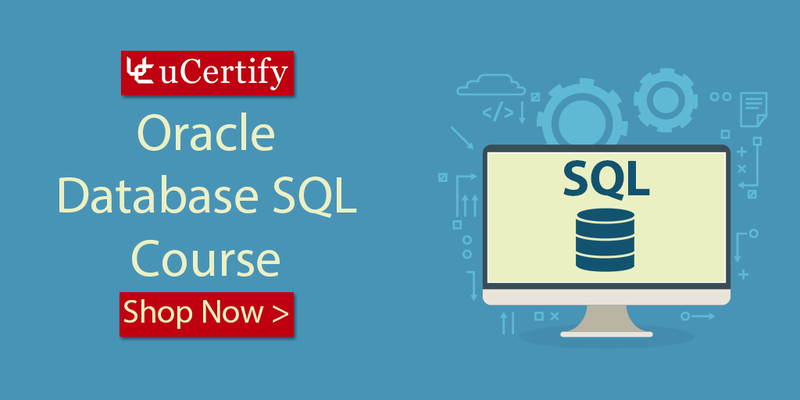 Enroll in the uCertify’s 1Z0-061 course which offers complete coverage of the Oracle SQL 1Z0-061 exam objectives and enhances your SQL skills. As each individual in this world is a unique nature, so is each vendor-specific implementation of Oracle SQL. A database server is also a product manufactured by a large number of prevalent vendors. Posted in 1z0-061, Database SQL, OCA, OCP, Oracle. For what reason would it be a good idea for you to achieve an IT certification? An IT certification is a prompt and easily perceived benchmark mapped to a particular range of abilities based on standardized testing. Achieving an IT certification will surely give you leeway when employers take a look at your resume. Having an IT certification will give you a significant edge over the other competitors who don’t have one. Regardless of whether you’re simply getting into IT or have been in the field for quite a long time, achieving an IT certification can enable you to demonstrate your insight and knowledge, enthusiasm for the business, and help you in your career growth. Check out the types of IT certifications such as CIW, Oracle, and Certiport that do not expire and save the hassle for re-applying. CIW Certifications: CIW is the globally perceived vendor-neutral IT and Web technology instruction and certification program. The CIW’s curriculum concentrates on the fundamental standards and employment abilities that empower the Internet to work, including Web design, development, security, administration, networking and databases. CIW credentials validate that the certified individuals have the job potentials essential to master an innovation-driven world. In the present competitive work environment, certified experts have demonstrated skills that set them apart from other Web experts. The CIW certifications are CIW Web Security Series Certification, CIW Web Foundations Series Certification, CIW Web Development Series Certification, and CIW Web and Mobile Design Series Certification. Oracle Certifications: Oracle is among the finest vendors in the enterprise IT market and the shorthand name of its leading product, a relational database management system (RDBMS) that is formally called Oracle Database. The database programming software supports a blend of transaction processing, business intelligence and analytics applications. The Oracle Certification Program validates you on abilities and knowledge associated with its products and technologies. A few Oracle certifications mentioned are Oracle Database Administrator Certified Associate Certification, Oracle Java Certified Professional Certification, Oracle PL/SQL Certified Associate Certification, Oracle MySQL Certified Professional Certification, and so on. Certiport Certifications: Certiport is devoted to helping you prevail through certification. Their globally perceived certifications are intended for improving your efficiency, marketability, and esteem. Certiport delivers in excess of three million exams every year through the secondary, post secondary, workforce, and corporate innovation markets in 148 nations and 26 languages. Certiport has presented an extensive range of certification exams for entry-level to experienced experts. Certiport offers IC3 certifications with its two variables IC3 GS4 and IC3 GS5. 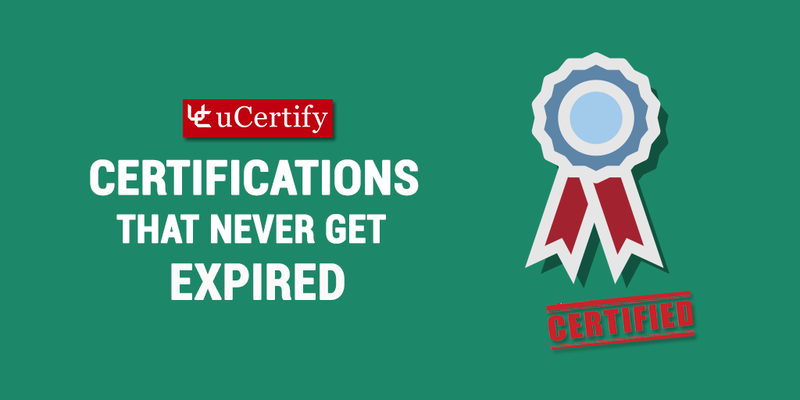 uCertify offers different test-prep, quizzes, exercises, performance-based labs, video tutorials, live-labs, and many other resources for the preparation of CIW, Oracle, and Certiport IT certifications. Posted in Certiport, IC3 GS4 Living Online Exam, IC3 GS5, IC3 GS5 Exam, OCA, OCP, Oracle, Web Security Associate certification. Java Programming language is one of the most used and popular languages in the world of application development. The reason behind this is its properties like, platform independence, object-oriented approach, reusable code and dynamic classes. These properties make it one of the most preferred languages for programmers. The best thing about this programming language is that it is quite easy to learn and easily implemented, thus making it highly favorable in the programming community. After knowing about the qualities of the Java programming language, you must be thinking about learning this language. Having a certification in this language can open doors of success for you. Oracle Java SE7 1Z0-803 & 1Z0-804 certification exams are the ones that can validate your Java programming skills and help you get the attention of dream employer. Our OCA/OCP Java 7 Programmer course covers the length and breadth of this platform-independent and object-oriented language that will help you learn and implement easily for programming purposes. 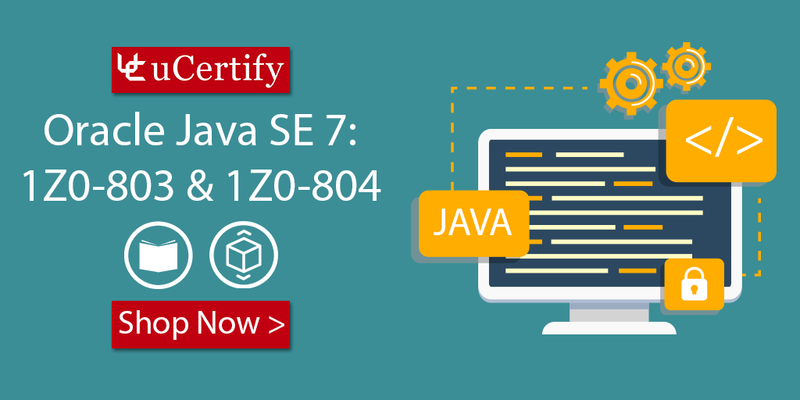 The Oracle Java SE7 course covers the objectives of 1Z0-803 & 1Z0-804 exams and includes topics such as object orientation, operators, working with strings, arrays, and arrayLists and much more. Oracle Java SE 7 Programmer exam is designed to certify the competency of Java professionals in understanding, designing, and manipulating Java applications. 1Z0-803 Exam: Java basics, handling exceptions, using loop controls, working with inheritance, using operators and decision constructs, and many more. 1Z0-804 Exam: Code fragments, descriptive comments, unintended line breaks, missing package and import statements, and many more. So, are you excited about preparing for the Oracle Java SE 7 certification? Get yourself enrolled in the uCertify cert guide and pass the Oracle OCA/OCP 1Z0-803 and 1Z0-804 exams in your first attempt. Posted in 1Z0-803, 1ZO-803, Java, Java SE 7 Programmer Course, OCA, OCP. SQL is the programming language that is being used extensively in storing and accessing information in relational databases. Over millions of developers are using this language 24×7. This makes it one of the most popular programming languages around the world. So, if you are looking to start a career in the field of development and thinking about becoming a developer, it’s almost certain that you’ll use SQL at some point in your career. Every good developer’s skill set should include a working knowledge of the SQL programming language. But what if you don’t know about the SQL programming language? Which is the best learning platform? uCertify is one of the best online learning platforms that offers 400+ ADA compliant courses for programming, security, networking, and many more. Get yourself enrolled in the Oracle Database SQL course and prepare for the Oracle OCA 1Z0-071 certification exam. The Oracle Database SQL cert guide covers all the objectives of the 1Z0-071 exam and provides skills in the basic functionality of SQL and some important elements of SQL development. The Oracle Database SQL 1Z0-071 study guide also provides knowledge and skills in the areas such as manipulating, restricting, and sorting data; using set operators; using subqueries; managing schema objects; controlling user data sets; single-row functions; and many more. Oracle Database Administrator Certified Associate certification program offers an entry-level credential that is designed to ensure the knowledge and proficiency of candidates to manage database tasks, features, and functions. The Oracle OCA exams are intended to measure a candidate’s ability to work as a junior team member with database administrators or application developers. This 1Z0-071 certification is the first step towards the more advanced OCP Database Administrator Certified Associate certification. So, get yourself enrolled in the interactive cert guide offered at uCertify and learn all the basic and advanced skills of Oracle Database SQL. The Oracle Database SQL study guide will help you pass the Oracle OCA 1Z0-071 exam in your first attempt. Getting certified validates your skills and knowledge in a particular field. This is a great way to build your professional career. The process of getting ready for your certification exam involves building knowledge, expanding your skill set, and boosting confidence! Becoming certified also provides an edge that sets you apart from the rest of the professionals. Oracle certifications can help you in your journey of success. The Oracle Certification Program is structured so that each level represents a skill-set and capabilities to a defined job level and role. Then progress onto the Oracle Java and Database certification to show your deeper more advanced possession of skills in a specific technology or product. The Oracle Certified Professional certification demonstrate professional’s ability to apply their skills in real-world scenarios and passing performance-based exams. 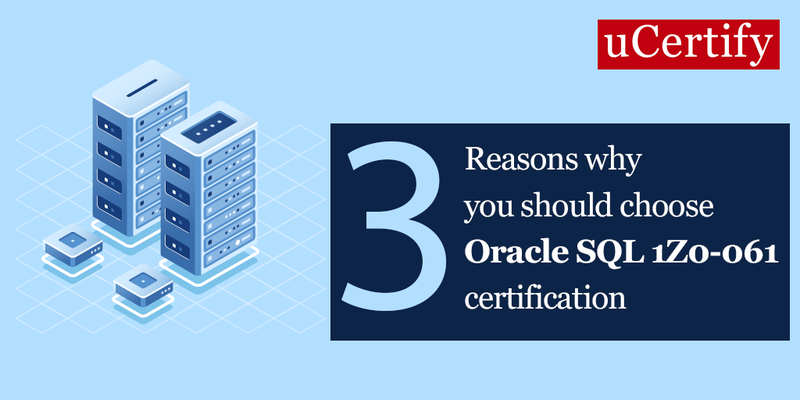 Continue reading the infographic to explore reasons you should go for the Oracle certifications. Surveys revealed that there is a high demand for Java and Oracle skills worldwide. Approximately, 93% of hiring managers believes certifications and certified professionals are beneficial for their organizations. Oracle Java is among the top five skills most demanded in today’s job market. Oracle certification helps you enhance your career prospects and offers salary raise. Having certification in the field required your employer will improve your job prospects to a great extent, 84% of the professional has confirmed this. Surveys proved that 90% of the professionals have found that Oracle certifications gave them the credibility and 70% have experienced salary hike after Oracle certification. Over 9% increment in salary is experienced with the Oracle Java and Database skills. Get started by selecting the exam that fits your role among the Oracle Java and Database exams such as 1Z0-804, 1Z0-062, and a lot more. Enroll in the uCertify study guide that will help you prepare for the cert exams. Posted in 1ZO-803, OCA, oracle certification.